The rupee recovered from over four-month low by strengthening 29 paise to 60.89 against the dollar in early trade today at the Interbank Foreign Exchange market on increased selling of the US currency. Forex dealers said a higher opening in the domestic equity market also supported the rupee but the dollar's gain against other currencies overseas limited the rise. 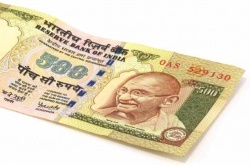 The domestic currency had lost 63 paise to close at over four-month low of 61.